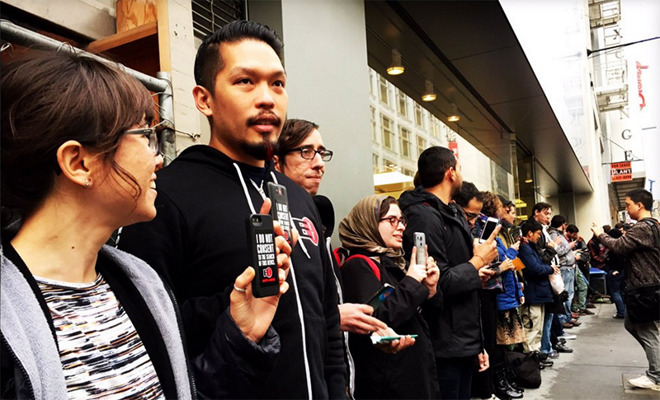 An internet rights advocacy group has held a rally outside a San Francisco Apple Store to support Apple's fight against government backdoors in its software. The small group of supporters stood outside Apple's downtown retail store on Wednesday and held iPhones that bore stickers reading, "I do not consent to the search of this device," reports The Guardian. The protest was organized by digital rights group Fight for the Future (FFTF) to protest the U.S. government's demand that Apple aids the FBI in hacking into an iPhone recovered from one of the attackers in the San Bernardino shooting that killed 14 people. Apple CEO Tim Cook quickly responded to the federal court order in a letter published on the company's website, stating that the demand demonstrated "government overreach" and set "a dangerous precedent." FFTF campaign manager Charlie Furman said he organized the event to bring the privacy community's appreciation of Apple off the internet and into the real world. "It's really important that we hold companies accountable when they're doing something wrong, but stand in support of them when they're doing something right," he said. Cindy Cohen, executive director of digital liberties group The Electronic Frontier Foundation, was also in attendance. "We want to show Apple that people are standing with them," she said. "Once Apple does it, other people are going to come and say, 'Apple, do it for me.' How do they say no the next time?" FFTF is planning national rallies to take place on Tuesday. The show of support follows comments from several tech company leaders backing Apple's stance on the issue, with members of the media and government officials both for and against Apple also weighing in. Under Tim Cook's reign, Apple has staunchly defended privacy rights and has urged the U.S. government to make a stand and support "no backdoors" in encryption, stating that creating a backdoor for law enforcement also creates a backdoor for "bad guys."